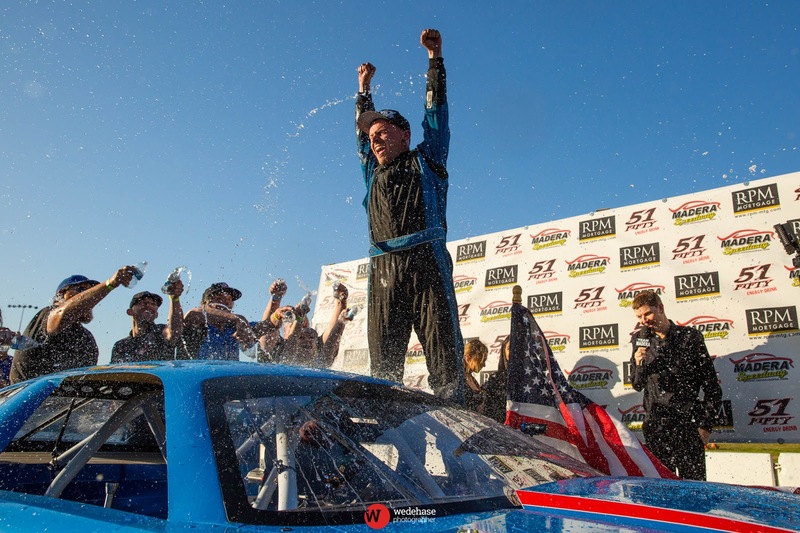 MADERA, CALIFORNIA (April 8, 2018) – 2016 RPM Mortgage Pro Late Model champion Matt Erickson continued to put his stamp on 2018, winning Sunday’s 80 lap round #2 for the MAVTV-televised series at Madera Speedway. Erickson now has $7,000 and two victories to open the series and leads the points standings as well. 15 year-old Austin Herzog, a six-time 51FIFTY Energy Drink Jr. Late Model race winner, set quick time and occupied the second row alongside Erickson at the start of the feature. 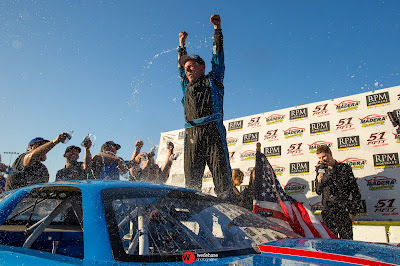 25 Pro Late Models took the green flag with Bakersfield’s Racin Vernon on the pole. Vernon led while Herzog jumped inside fellow Jr. Late Model graduate Kolby Berry quickly to take second place. Erickson went outside Berry to take third not long after. Herzog immediately applied pressure to Vernon before a caution on lap seven for Jack Wood spinning out in turn four. Vernon managed to keep Herzog at bay with Erickson and Glen Cook in tow as the race went green until lap 20 for Henk Gaalswyk spun out in turn two. Herzog used the outside on the ensuing restart to roar past Vernon for the lead, which he held for two laps until the next caution. Vernon and Cook went side-by-side and slid through turn three, with top-ten qualifier Shelden Cooper hitting Vernon significantly. David Lewellen was also eliminated when he spun and was tagged by Berry. Erickson seized the lead from Herzog on the restart but Herzog took it back on lap 23. The next caution was for rookie Nick Grossi stopped in turn one on lap 36. That caution gave Erickson his shot to get back past Herzog in yet another lead change. Gaalswyk spun again on the restart on lap 39 which led into the lap 40 break on the front stretch. Following adjustments it was Erickson and Herzog picking up where they left off with back and forth battling. Rookie Adam Lemke nosed into the front stretch wall off contact with Dillon Tucker for a lap 46 caution. Rick Thompson spun on lap 47 for his own caution period. Two-by-two battling for fourth saw Jack Wood advance into that position to cap a great drive through the field. Garland Tyler spun in turn four for a yellow on lap 69 and five laps later Cook and Kolby Berry tangled in turn three for yet another caution period. Each successive restart saw Herzog nose inside Erickson but unable to complete a pass. The lap 74 restart proved the most crucial for Herzog as he sailed inside Erickson into turns one and two and drag raced side-by-side down the backstretch. The duo made door to door contact into turn three, forcing Herzog into a spin to bring out the caution and relegate him to the rear of the field. Ryan Hart attempted to challenge Erickson on the restart but spun the tires, but a lap 75 caution for Berry spinning on the front stretch gave Hart one last bit of life. Hart was unable to capitalize and had to follow Erickson across the finish line. Rick Thompson fended off Gaalswyk by a nose for third as well with Jack Wood managing a career best Late Model finish of fifth as well. 2017 51FIFTY Energy Drink Jr. Late Model champion Jesse Love grabbed his sixth career series win when he stormed to Sunday’s 60 lap victory. Love qualified second and started fourth behind a front row that included both fast-time qualifier Tanner and Tyler Reif of Las Vegas. Tanner Reif jumped out front before the race was slowed when female rookies Kayla Eshleman of Fontana and Olivia Manke tangled in turn one. The following restart saw third starting Austin Edwards get boxed outside and eventually drift as low as eighth position. Love followed sixth starting Anthony Guaimano closely as they moved through the pack for much of the first half. Guiamano worked up to second place before losing the position to Love on lap 23. Bakersfield’s Kabe McClenny, the opening night runner-up, qualified eighth but challenged Lilly Mead for fifth on lap 35 in a nice side-by-side battle. Reif led the field to the lap 40 break trailed by Love, Guiamano, Tyler Reif, and Mead. Things changed quickly on the restart when Love used the outside line to edge forward on Tanner Reif for the lead. Love finally stole the lead from car #43 on lap 43, while Mead looked inside Tyler Reif for fourth. Tyler Reif and Anthony Guiamano collided in turn one for a lap 48 caution that sent both young racers to the rear of the field. Love elected to start inside Tanner Reif for the critical late race restart but still managed to charge ahead. Eshleman began to work her way forward, finding herself in a tight race with McClenny for third in the closing stages. Love dashed to a 1.222 second victory over Tanner Reif with Eshleman third by a nose over McClenny. Guiamano made a comeback drive to round out the top-five. Love and Reif will be in a near dead heat in the points going into the third round on April 28th. Jason Lawton broke the Jillaun Holden stranglehold in the Toyota Sedans by winning the third round of the 2018 series. Thomas Magray led the first four laps of the feature before Holden took the lead on lap five. Lawton quickly moved forward and took the lead on lap seven. A big crash in turn one slowed the competition on lap 16 but Lawton proved strong enough to hold Holden at bay over the final nine laps for the win. Holden, Greg Tyler, John Tevis, Jr. and Magray rounded out the top-five. The Modified Super Toyotas had multiple lead changes entertain the crowd over the 25 lap main event, with Patrick Geiger outlasting numerous challengers for the victory. Tim Kammerer led the first two circuits but lost the lead to Shaun Reynolds on lap three. Bert Stephens charged up into the lead on lap 11, before being swallowed up in a three wide battle to fall back to third on lap 13. Stephens then spun to bring out a caution in turn two. Geiger used a series of cautions to move up to second and then take the lead from Reynolds on lap 18. Stephens and Dave Lander both got around Reynolds in the closing stages of the race. Geiger, Stephens, and Lander were the top-three at the finish. Bakersfield drivers again reigned supreme in the Mini Cup vs. Bandolero 20 lap feature, with 12 year-old Kercie Jung taking the Bandolero event and Kale McClenny taking the Mini Cup honors. The 11 car field suffered several incidents, including on the start when the front row Bandos of Seth Wise and Zachary Ginn came together in turn two. Ginn lost his right front wheel in the crash while Wise made impact with the wall. Both were done for the day. A red flag stopped racing on lap four when Mini Cup rookie Jayce Mcarthey spun into Joseph Holliday and flipped over exiting turn two. The young driver was OK.
Jung paced Bakersfield’s Riley Massey, also in a Bando, over the final 16 laps for a strong win, while McClenny led the Mini Cup trio of Aaron Thomas and Holiday across the line. “Super Spring” continues at Madera Speedway on Saturday April 28th with round #3 of the RPM Mortgage Pro Late Model Series and 51FIFTY Energy Drink Jr. Late Model Series.